TMS is a way to non-invasively stimulate the brain. We use single and paired-pulse TMS to investigate changes in motor cortical activity in response to behavioral and neurophysiological interventions. This technique can be used to assess intracortical inhibition and neuroplasticity. 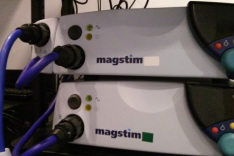 The lab has a Bi-Stim TMS stimulator (Magstim) capable of delivering paired stimuli and a 70mm figure-of-eight TMS coil. Neuronavigation is used to accurately target TMS stimulation in the brain. The subject's head can be registered to an MRI of their own brain, or to a standard brain, to allow precise coil positioning and the ability to repeatedly stimulate in the same location. We have a Brainsight neuronavigation system (Rogue Research). The KINARM robotic manipulandum and 2D virtual reality system allows us to study a broad range of upper limb motor behaviors. We currently use it to study force field adaptation by programming the manipulandum to apply forces systematically to the subject's hand as the subject moves to visual targets. We use EMG to record motor evoked potentials (MEPs) that result when TMS is applied to the motor cortex of the brain. Changes in MEP amplitude can be used to study changes in excitability and other aspects of cortical neurophysiology. The lab has an 8-channel EMG system (AMT-8, Bortec), Micro 1401 and Signal software (CED) to control delivery of TMS and other stimuli and record MEPs. This device is used to apply electrical stimuli to one or more peripheral locations (muscles or nerves). Stimuli can be triggered in sync with TMS pulses (Paired Associative Stimulation, or PAS), or two motor points can be stimulated synchronously. 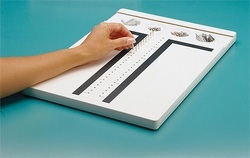 The system is also used to study spinal reflexes such as H-reflex. tDCS is used to transiently modulate activity in a specific region of the brain. This safe and non-invasive technique helps us determine whether brain plasticity is involved in a sensorimotor behavior. We have a dual channel Chattanooga Ionto tDCS machine (Iomed). We use this apparatus to examine how the brain resolves discrepancies between different kinds of sensory information. Subjects make reaching and pointing movements on the lowest surface while looking into the mirror. Images reflected in the mirror from the projection screen (top) make it appear as if the images are in the same plane as the unseen hands. We use a custom apparatus designed and built by Dr. Block. IU's Advanced Visualization Lab provided materials and expertise for our projection setup. We use a variety of applications, including MATLAB (Mathworks), Signal (CED), and Visual Studio 2012 (Microsoft).